UNIGUARD (Aura, Micron, Prism, Sparx and Zero) was formed by United Nations Undersecretary-General Robert Donovan in response to the god Anubis taking over Egypt. While the heroes were defeating the deity, Donovan was arranging with the heroes' home governments to have them remain together after the threat. They are based in the secret 41st floor of the Secretariat Building of the United Nations. 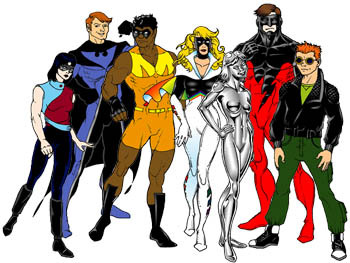 Silver and Blackbird joined soon after the group was formed.